Tropical Art Suppliers Encourage Artists. There are numerous small retail tropical art suppliers in the Cairns region. A couple of decades ago, artists would have ordered their artist supplies - paint, clay, paper and canvases from “down south” and then waited patiently (or impatiently!) for them to arrive per train or road transport. With the increase in population and the revival of a variety of hobby arts and crafts, suppliers have responded to the demand and now stock almost every type of material for the professional or hobby artist. Various art and craft classes throughout the region have also fuelled this need as have the growing number of galleries, exhibitions and art competitions. 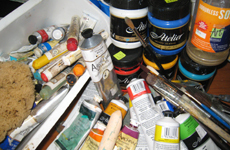 There is a wide range of choices of artist supplies, with most local retailers stocking imported materials as well as those produced in Australia. A few of the best stocked and reliable art suppliers are The Art Barn, Cairns Craft Supplies and Cairns Drawing Supplies. The Cairns region is fortunate to have a major paint manufacturer, Jim Cobb, from Chroma Australia, working from his studio/ laboratory in the mountains near Port Douglas. Jim and his wife, Josephine, both practising artists, are frequently invited by various art groups to give workshops on some aspect of their paints. They are very generous in their support of artists and educational institutions. For a couple of years our old gallery, Port Douglas Gallery of Fine Art, held competitions in conjunction with the Port Douglas Village Carnivale. Jim and Josephine very kindly helped to raise money for prizes of excellence through the sale of their own work and by the donation of paints for winning artists. Their generosity resulted also in the forging of new relationships between artists and this paint manufacturer, so that each received "feed-back" about the development and usefulness of new products. I imagine this situation to be rather special and unusual. Artquest Port Douglas used to take visitors to meet this interesting and talented scientist/artist couple in their mountain studio. Whether you are a student, a professional artist, a hobbyist or a creative visitor, you may be assured of finding materials with which to create those fantastic masterpieces, right here in tropical Australia!